Looking back at my Journal, I see that July has normally been a “dry” month for fishing down on the White River in Arkansas. Last year was particularly hot and the generation schedule not to mention the water temperature was not particularly conducive to good fishing. This year we have received something of a reprieve and have been enjoying relatively mild mid summer temperatures although as always, a little rain would always be welcome. The generation at Bull Shoals has been providing some minimum flow during the nighttime hours and slowly ramping up from 50 cfs at mid morning to about 1300 by late evening. This has been providing good wading during most of the day followed by a flush of oxygenating water overnight. The minimum flow has helped keep the daytime water temperature down although my mid afternoon reading showed it to be running at 67 degrees. With this high a water temperature the fish would be congregating at high oxygen sources and deeper water during the hotter part of the day. The lower daytime ambient temperatures have probably helped with keeping the water temperature from moving into hazardous levels although I would recommend that you try and conclude your fishing by early afternoon to prevent stressing the fish. Also be aware that these slowly increasing levels can be deceptive and you should stay aware of your location at all times so you aren’t caught out by rising water. As conditions seemed to somewhat favorable we decided to make a slightly earlier start and arrived at Rim Shoals to find an empty parking lot and an almost cool air temperature. The last time we fished here I had waded the bank downstream to see how many big browns I could spot on the shoreline. I counted about ten fish in the 18 to 26 inch range and a couple that were probably somewhat bigger; just about all of which I spooked without getting a shot at them. This time I decided to hike downstream before entering the water and then wade back up to approach the fish from a better angle. Just after entering the water a couple of rising fish further out caught my attention and so I offered them the tan foam hopper I had intend to use for those browns. It proved irresistible and I landed a couple of ten inch rainbows in quick succession. While attending to the last fish I heard a distinct “click” and down my line slid the tip section of my beloved Helios! After reverting to my native Anglo Saxon language for a few moments I considered my dilemma; should I continue with the top eight inches of my fly rod missing or walk back for my other rod. A couple of trial casts proved I could use the top ferrule as a tip-top and so I decided to continue with my plan although once I was close to the car I would exchange rods for the remainder of the day. I’m not sure what the Orvis rod builders would think of this but they didn’t have a hot half mile walk in front of them! I am so glad I made this decision because after only a few yards of stealthy approach, a bank-side cast was rewarded by a swirl and a large head engulfing my fly. My next worry was would my rod allow me to fight the fish without the tip section; well I satisfied that very quickly and landed a male brown of just under twenty-one inches. After the obligatory photographs and a few moments to allow him to recover, I released this master mariner to grow into the monster he may one day become. Moving upstream and steadily working every pocket I caught a few smaller fish, both rainbows and browns until once again my presentation was rewarded with another swirl and a short battle. This time it was a fat (one is allowed to use this word when describing fish!) 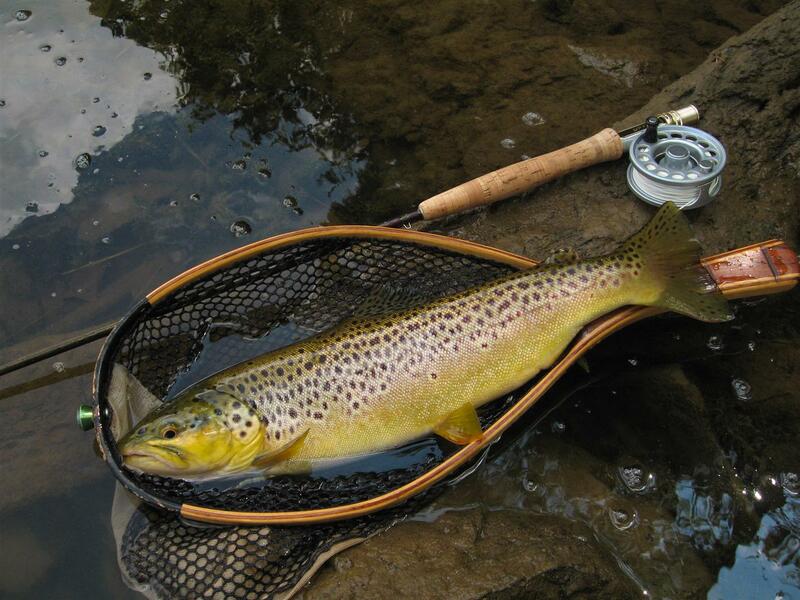 healthy female “blue-spot” brown stretching the tape at eighteen inches and one of the best conditioned fish I have encountered in this section of water. She was almost perfect with great fin structure and hardly any blemishes on her body. A few more photographs and then she too returned to the watery realm. During the rest of my journey upstream I spooked about four more large fish and missed the take on two others although I was extremely satisfied with the day’s work and the possibility of doing it all over again at a later date. After returning to the car for the rod exchange, my fishing buddy and I headed back downstream for the remaining hours of the day. The heat was starting to press down on us and the humidity was adding to the amount of moisture saturating my shirt. The middle part of the afternoon was very slow with only a few fish were taken on a variety of flies, both dries and soft hackles. The occasional fish was rising and a few caddis were on the water although I suspect the high water temperature had sent the fish for their afternoon nap; not a bad idea. As the sun began its slide towards the horizon I finished the day with a flourish of fish taken on an orange Stimulator from one of the better riffles. Although it wasn’t obvious, the water had also began to rise and I assume to flow induced a stronger feeding activity. It’s always a nice way to end the day with a few nice fish although my memories of those two browns taken on dries by the bank will stay with me for very long time. 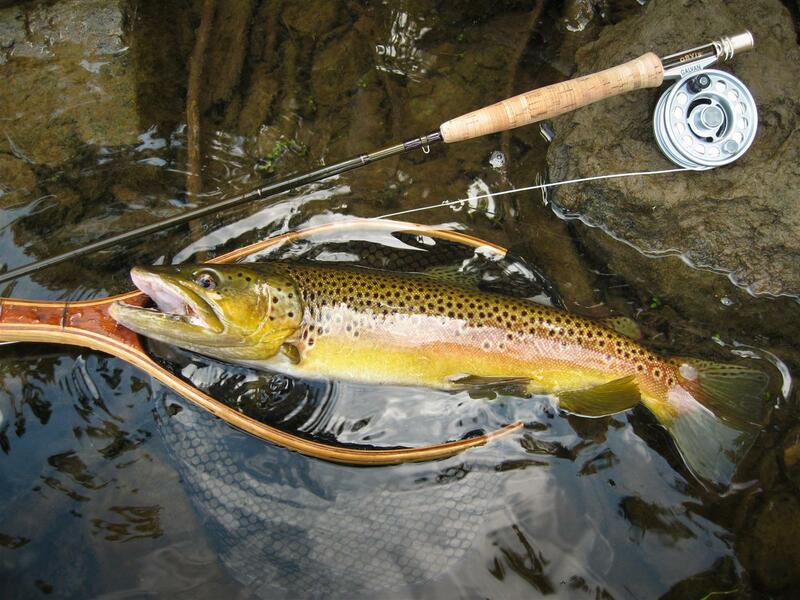 This entry was posted in Fly Fishing, Stream Report, Uncategorized and tagged arkansas, brown trout, fish, fishing, flies, fly casting, fly fishing, fly tying, keith, Orvis, oxby, ozarkenglishman, rainbow trout, rim shoals, softhackles, trout, white river. Bookmark the permalink. You write wonderful….just comparing your notes to those written by your Father. Is this Irene as in Mike and Irene? Your mention of my father gave me the hint. Thanks for your comment, I am glad you like my writing, its fun.